The El Capitan Desktop in your MacBook isn’t made of wood, and you can’t stick your gum underneath. However, this particular desktop does work much like the surface of a traditional desk. You can store things there, organize things into folders, and take care of important tasks such as writing and drawing (using tools called applications). Heck, you even have a clock and a trash can. Gaze upon the OS X Desktop and follow along as you venture to your Desktop and beyond. Everything El Capitan starts here — the OS X Desktop. The Dock is a versatile combination: one part organizer, one part application launcher, and one part system monitor. From the Dock, you can launch applications — for example, the postage stamp icon represents the Apple Mail application, and clicking the spiffy compass icon launches your Safari web browser. Icons in the Dock also allow you to see what’s running, and display or hide the windows shown by your applications. The Dock can contain all sorts of exotic icons. It can appear at different edges of the screen. It can disappear until you move the pointer to the edge to call it forth. Note that an icon can represent applications you run and documents you create. Sometimes you single-click an icon to watch it do its thing (as in the Dock), but usually you double-click an icon to make something happen. The menu bar isn’t found in a restaurant. You find it at the top of the Desktop, where you can use it to control your applications. Virtually every application you run on your laptop has a menu bar. Click the menu title (such as File or Edit). Choose the desired command from the list that appears. Clicking a menu displays a list of menu commands. When you click a menu, it extends down so that you can see the commands it includes. While the menu is extended, you can choose any enabled menu item (just click it) to perform that action. You can tell that an item is enabled if its name appears in black. Conversely, a menu command is disabled if it appears grayed out. Clicking it does nothing. The Apple menu, which is identified with that jaunty Apple Corporation icon, . 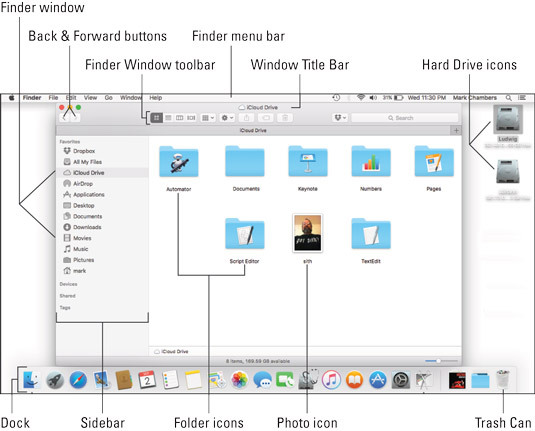 This is a special menu because it appears in both the Finder menu bar and the menu bar in every application you run. 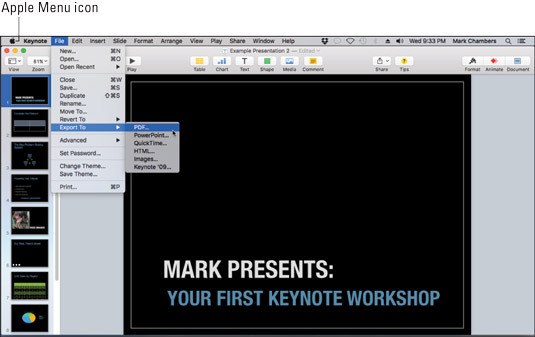 It doesn’t matter whether you’re in iTunes or Photoshop or Word. If you can see a menu bar, the Apple menu is there. The Apple menu contains common commands to use no matter where you are in El Capitan, such as Restart, Shut Down, and System Preferences. The Application menu, which always bears the name of the active application. For instance, the DVD Player menu group appears when you run the El Capitan DVD Player, and the Word menu group appears when you launch Microsoft Word. Whenever the Finder itself is ready to be used (or, in Mac-speak, whenever the Finder is the active application), the Finder menu bar appears at the top of the screen. You know the Finder is active and ready when the word Finder appears at the left of the menu bar. For example, in the Finder window, El Capitan gives you access to the applications, documents, and folders on your system. You use Finder windows to launch applications, to perform disk chores such as copying and moving files, and to navigate your hard drive.